Home › Home and Kitchen › Dazzling Toys Neon Colored Plastic Gangster Hats Kids Costume Party Booth Hat.. 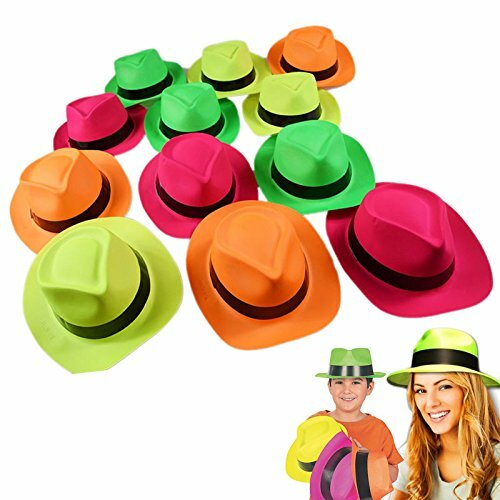 Dazzling Toys Neon Colored Plastic Gangster Hats Kids Costume Party Booth Hat..
Great for all occasions including bachelor and theme-alike parties; the hats fit older kids to adults. Create a fun 'photo booth' at your teenager's party; they'll love it! An inexpensive way of livening up any get-together. This set of 24 Neon Colored Plastic Gangster Hats will go down a storm at yournext get-together. Perfect for rock-star, bachelor or theme-alike parties, thehats fit older kids to adults and are an inexpensive way to to liven up anyoccasion. Why not add a fun 'photo booth' to your teenager's next birthdayparty; their friends will love it!